Design a kitchen you’ll want to spend all your time in! It’s easy to bring beauty, durability and functionality to the most popular room in your home when you spruce it up with beautiful countertops. Our quick guide will educate you on different types of stone so you can determine which one is right for you! Whether your home features a poolside barbecue or outdoor kitchen area, it’s important to know what materials to use in an outdoor countertop. Withstanding the elements while still offering a stylish preparation area is important, and there are many materials that can accomplish this. When installing an outdoor counter, there are three main options available: stone, concrete, or tile. Stone is a popular option for outdoor countertops, and is considered by many to be the optimal choice. Among the types of stone available, granite is the toughest and can stand up to any outdoor elements. If properly maintained, including sealing when needed, granite counters can look great on outdoor kitchen areas for years. 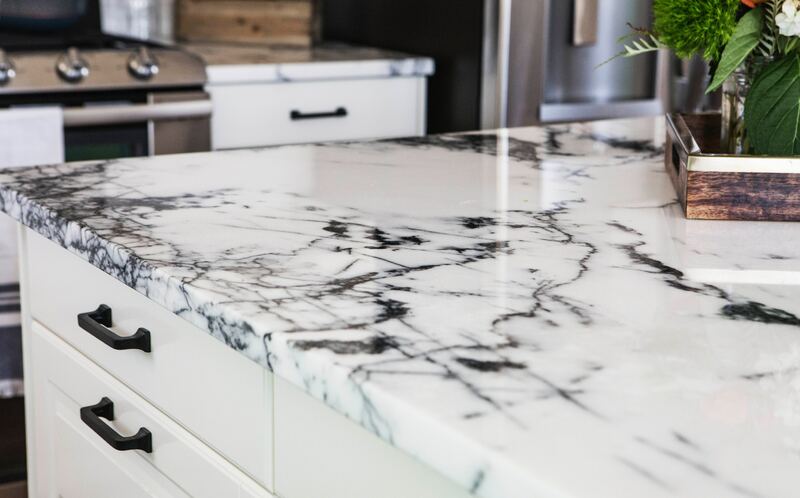 If you’ve got a budget in mind, granite can even run cheaper than concrete, and some options are dense enough that you won’t even need to worry about sealing them. Other stone options include soapstone, slate, and marble. These can vary widely in durability and price, so it is important to thoroughly research these options before a purchase. For instance, soapstone is highly resistant to staining when sealed, but when left unsealed it can be highly susceptible to fingerprints, liquids, and oils. In general darker stones can also heat up in the sun, so if you live in a warm area it may be important to keep this in mind. Concrete is quickly becoming a common choice, as it offers limitless options for designs. Although this material is durable, it can crack easily if it is installed incorrectly. The color can also yellow in the sun, but choosing certain colors or coverings can alleviate this issue. Chips and scratches can occur with enough wear, but if you take care of concrete and seal it regularly, it can last for many years, even in freezing climates. With a bit of creativity, you can embed anything from recycled glass to seashells in the countertop for a unique flair. Tile is the most economic option, especially in the short-term. After time, some grout may need to be replaced or refreshed. Lots of options are available, although you should be sure that your chosen preference is designed for outdoor use, or it may wear out quickly. Keeping tiles clean is also easy compared to other materials, but the maintenance to keep the grout clean can be a hassle. If you pay regular attention to it, however, you can keep a tile countertop looking fresh for years. There are many options available, but you may want to avoid Corian or Quartz, as these materials will fade and become discolored in sunlight. Even seasoned experts may disagree over the best choice, so you may want to weigh the pros and cons of each versus your own budget and preferences. If you have any questions about the available options, contact a countertop installation company with experience in outdoor counters.